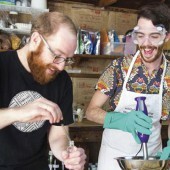 Experimenting with various soap ingredients is part of what makes soap making so much fun. 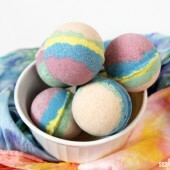 In addition to scent and shape, adding color to soapy creations gives your product personality and flair. 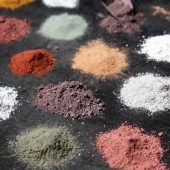 Luckily there are plenty of colorants to choose from, including LabColors, pigments, micas and natural colorants such as clays. 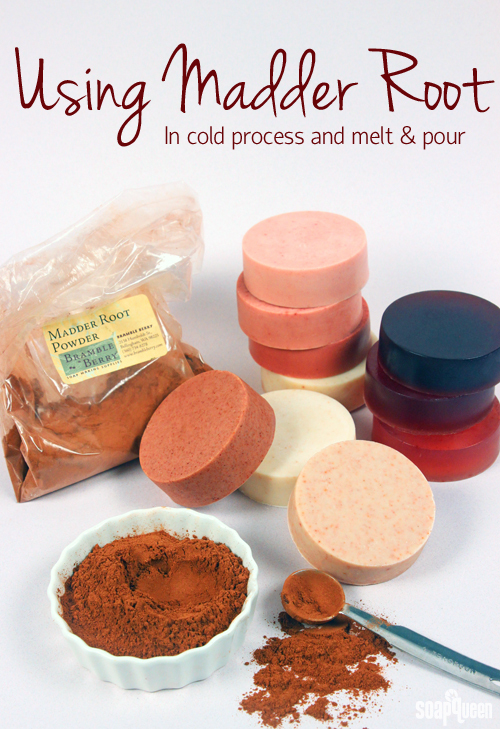 If you prefer to use natural colorants, madder root powder is a great orange-red colorant option for both cold process and melt and pour soap. A plant species in the genus Rubia, madder (INCI: Rubia tinctorum) is a climbing plant with small flowers and long roots. Madder root has been used for centuries as a dye for textiles and cosmetic products. Traces of madder have even been discovered in the tomb of the Pharoah Tutankhamun and in the ruins of Pompeii. 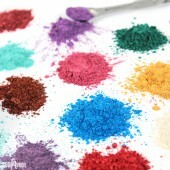 The FDA requires approved cosmetic colorants to be used when specifically coloring cosmetics. 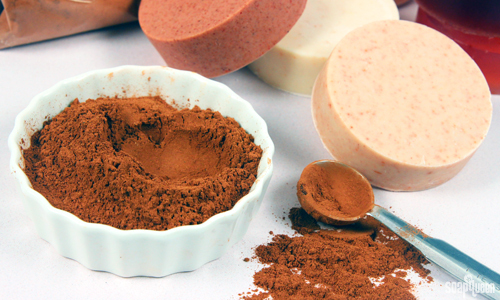 Because madder root has not been approved as a cosmetic colorant, it should be used in soap for its herbal properties and not its inherent coloring ability. Madder root is considered not safe for infant products so do not use madder root with baby products. Rubia tinctorum contains the organic compound alizarin, which give the roots their deep red color. 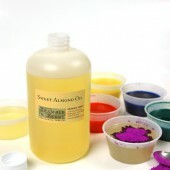 Alizarin is also used to create madder lake pigments, which are sometimes referred to as rose madder and alizarin crimson. Madder lake has been used for centuries by painters to give their pieces rich red tones. In 1869, alizarin became the first natural pigment to be duplicated synthetically. 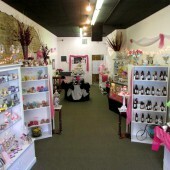 In soap, madder root powder produces colors ranging from light pink, deep red and mauve. 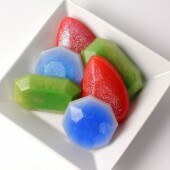 The color it produces depends on the type of soap, the amount used and production variables such heat and application. 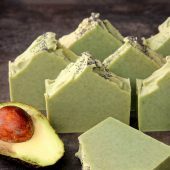 When using natural herbs in soap, the herbs can be added at trace or infused in the soap making oils for a speckle-free look. 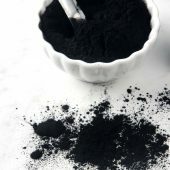 Some natural herbs such as indigo powder, benefit from reconstituting the powder in your lye solution. 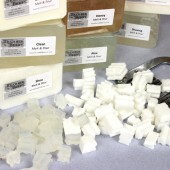 To demonstrate the hues madder root produces, various usage rates were tested in both cold process and melt and pour soap. 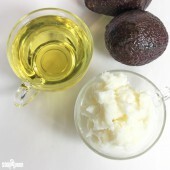 In this experiment, the madder root was dispersed in sweet almond oil at a rate of 1 tsp. 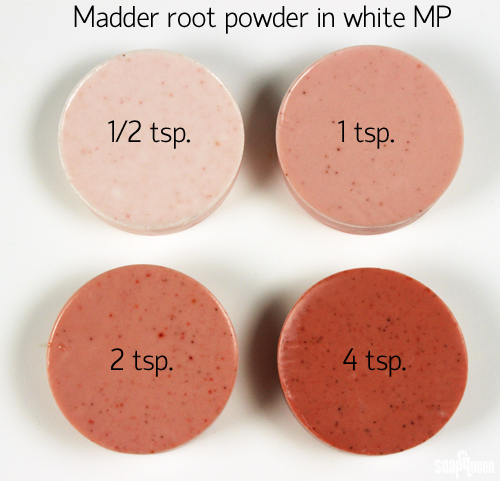 madder root powder, to 1 tbs. sweet almond oil. 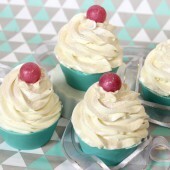 A mini mixer was used to get rid of any clumps. 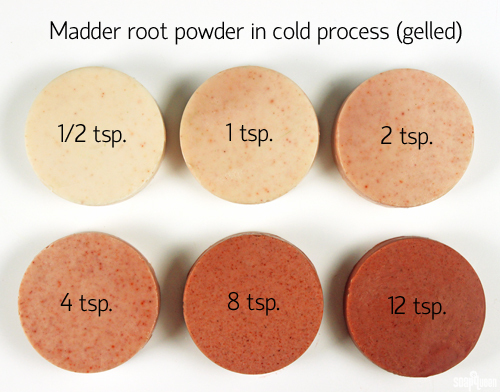 The madder root mixture was then added to cold process soap during trace. No fragrance was used. 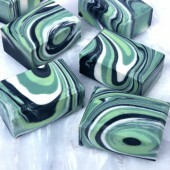 The measurement on each soap refers to the amount of madder root mixture used in one pound of soap. 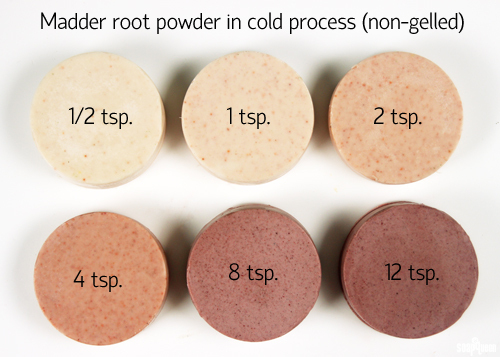 As you can see, heat plays a huge role in the color of madder root powder! In the first photo, the soap was placed on a heating pad and insulated to promote gel phase. 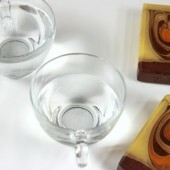 In the second photo, the soap was not insulated and kept at room temperature. Going through gel phase produced a red hue, while the non-gelled soap is more mauve. 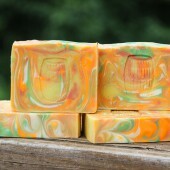 Because the color was added at trace and not infused, the soap does have small speckles. 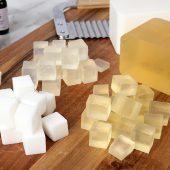 Gel phase has a similar effect on soap containing LabColors, micas and pigments; the colorants become much brighter, and the soap has a more translucent look. If you’d like more information regarding gel phase, check out the Jazzed About Gel Phase blog post. In particular, this blog post demonstrates the affect of gel phase on LabColors. Below, madder root powder was added to clear melt and pour base and white melt and pour base. 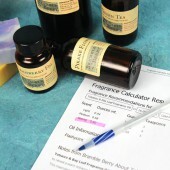 The madder root powder was dispersed in 1 tsp. madder root to 1 tbs. 99% isopropyl alcohol, and a mini mixer was used to help remove large clumps. 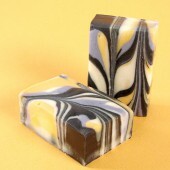 The madder root mixture was added to melted soap. 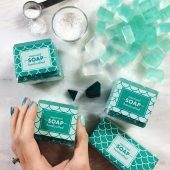 The measurement on each soap refers to the amount of madder root mixture used in one pound of soap. 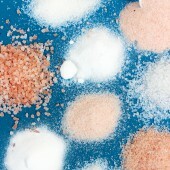 When used in white melt and pour, madder root powder gives a range of pink hues. 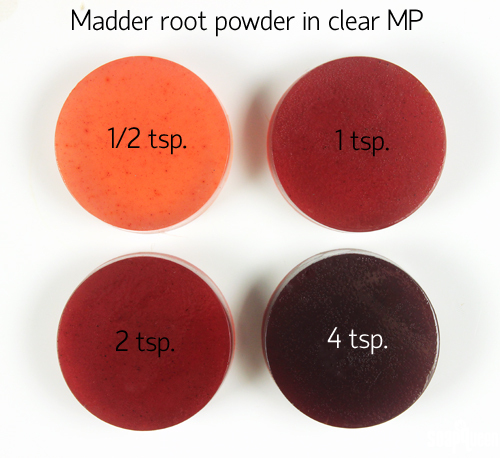 In clear melt and pour, madder root powder results in more orange, deep red tones. Both are beautiful, rich colors. 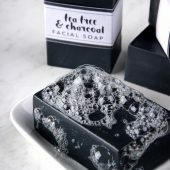 To help the madder root speckles suspend evenly, pour the soap no warmer than 125 °F. 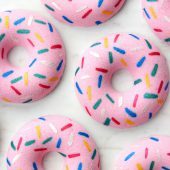 Looking for more information on using natural colorants? 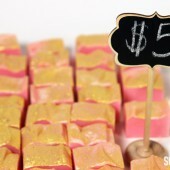 Check out the Sunday Night Spotlight: Natural Colorants blog post! 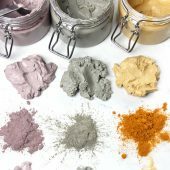 Do you have a favorite natural colorant? 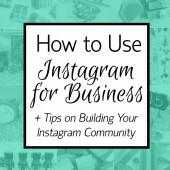 I would love to hear your tips and tricks for using it! What was the batch size that you tested on? 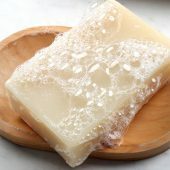 I see how much madder root was used, but not how much soap. I assume a 1lb batch, but I’d like to be sure. Thank you! 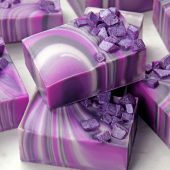 I have made soap with madder root powder in the top portion and the color did turn out lovely. However, I am now concerned that if I am going to have my soap for sale, that I may need to somehow “warn” against the madder root powder. 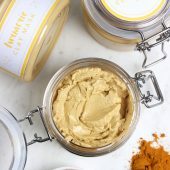 Do you believe I need to have a disclaimer about health risks, or is it more for things taken internally, or possibly taken internally (such as the lip colorant in one of the first comments on this page)? Thank you for your time. 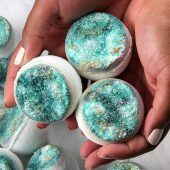 So glad to hear that color worked well in your soap! 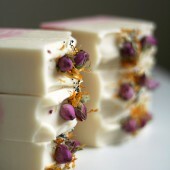 Madder root is skin safe and is totally fine in soap recipes. 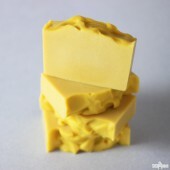 We just don’t recommend it in lip products, as it not meant to be ingested. 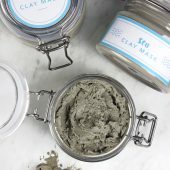 Hi, can madder root powder be used to make red lipstick? I want to make vegan red lipstick so do not want to use carmine and want to avoid using d&c lakes for their carcinogenic properties. What other organic, vegan options do I have for red lipsticks? Would really appreciate the help! 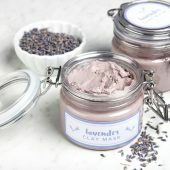 I just heard back from our vendor and they said madder root is not safe for use in lip products. We don’t recommend using it in your lip balm. 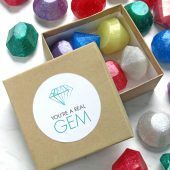 Pigments and oxides are considered “nature identical” meaning they are the exact same chemical structure as the platelet minerals found in the earth. But they are created in a lab to ensure purity. 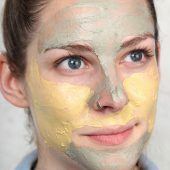 Oxides and pigments are the same product that mineral make up lines use to achieve lovely natural hues. 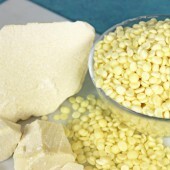 Manufacturing nature identical products keeps the bad stuff, like lead and arsenic for example, out of the colorants. 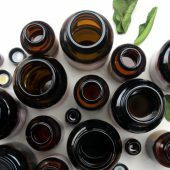 As for micas, some are considered natural and some are not. The Cellini Red Mica, which you will see on the INCI (International Nomenclature of Cosmetic Ingredients) the description page, contains D&C Red 7 which makes this colorant not natural. Copper Sparkle Mica, on the other hand, only contains mica and iron oxides, which both readily occur in nature so it is considered natural. 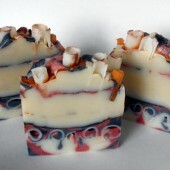 I was wondering if the Madder Root Powder would work in the Pumpkin In-the-Pot Swirl from the Soap Crafting book. It was described above as “producing colors ranging from light pink, deep red and mauve”. The picture on my computer screen looks like a pumpkin orange. 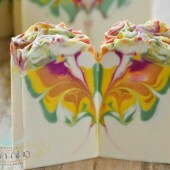 i love the soap and colors. i have been watching some of the videos on your soup making. Am really interested in soup making but i reside in Nigeria. I’m so glad you like the post! As of July 2014, we can no longer ship to Nigeria. Sorry about that! 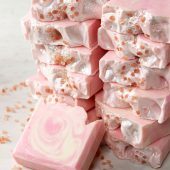 I was wondering if madder root would be safe to use in butter based exfoliant bars and bath truffles. The red color is so much more vibrant than the clay blend I use right now… But I’m worried that it might stain the skin (had that trouble with tumeric. Oops!) what are your thoughts? 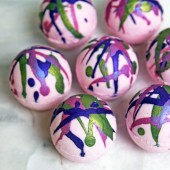 We haven’t used madder root powder in bath truffles, so I’m not exactly sure! 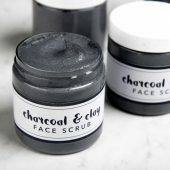 I can’t wait to get my hands on this and try it in my soaps! The color is beautiful and I really like the speckled look. 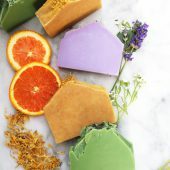 Most Ot The Names Of Plants You Use Unfortunately Not Common In My Country Uganda And Many People Have Not Taken On Homemade Soap And Cosmetics, Therefore No Stores For EOs, And Most Herbs And Oils. 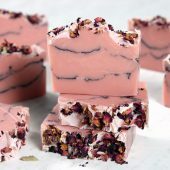 Do you get any scratchy feeling from adding the Madder Root directly to your soap? 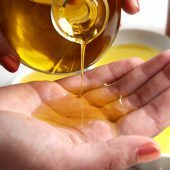 I’ve tried infusing olive oil with Madder Root, but it just seems to settle on the bottom without much impact on the oil color, regardless of how many times I shake daily or how long it sits. Adding higher levels of madder root can create a slightly scratchy feeling, which is something you’ll want to keep in mind. 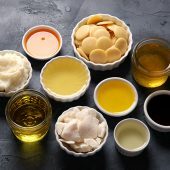 I just added 3 tbsp madder root powder to 12oz of olive oil, and have been keeping in a sunny window, shaking once or twice a day. I think cooking that powder with your oil can help make it a little darker. 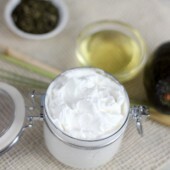 Here’s how: In a crock pot or pan on the stove top, add your olive oil and your madder root powder. Then, turn your pot on low and let the mixture infuse for two hours. 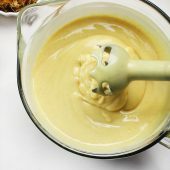 Make sure it doesn’t get too hot, you don’t want the mixture to scorch! 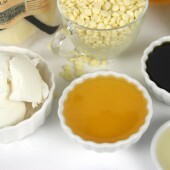 Then, strain your colored oil into a jar to remove any bits of powder that may be leftover. The photo at the top has a dark blue soap at the top of the right stack – I don’t see that one explained below. Would you mind letting us know how the dark blue was achieved? 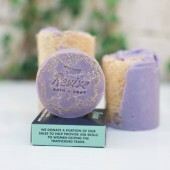 In that picture when it’s stacked on the other soap, it does look kind of blue! 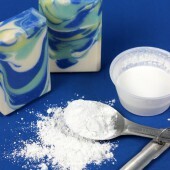 If you’d like a natural blue hue in your soap, you may like Nautral Indigo Powder. 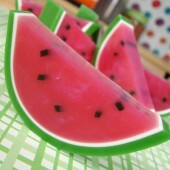 I’ll include a soap tutorial with it so you can see the beautiful color it produces! Love this post! I bought some madder root last time, but did not know how to use it yet. Could you please add more info about infusing it, too? 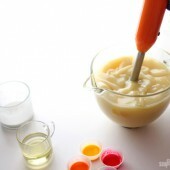 Here’s how to infuse it: Choose one of the liquid oils going into your soap recipe. 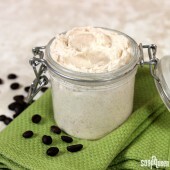 In a crock pot or pan on the stove top, add your oil and your madder root powder. 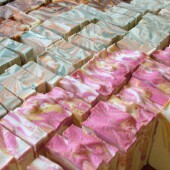 Madder root is a favorite of mine–I love the variety of colors that it gives to soap! Not many natural colorants are so vibrant. While I occasionally leave some speckles in, I prefer the solid color look of infused madder oil. Excellent post, thank you! 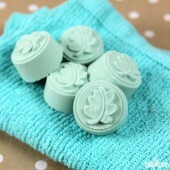 We only use natural colourants at Clear Conscience, currently using pink argiletz clay. Have been meaning to try madder root!